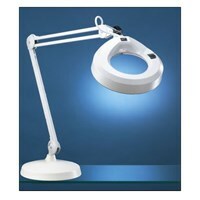 This KFM Magnifier Lamp features a patented 30-in. reach internal spring arm for full adjustability. A reflector optimizes light output and distributes illumination evenly across the work area. The 5-in. diameter, 5-diopter 2.25x optical-quality glass lens is mounted in a die-cast aluminum housing which allows for optimal magnification while an electronic ballast increases light output by 15 percent. The 22-Watt bulb (included) is protected by an acrylic splash guard/diffuser. Also included is a weighted base mount. Color: Light Grey.